The effects of 1-methylcyclopropene (1-MCP) on physicochemical properties and sensory characteristics of Fuji apple fruits stored at 2 °C for 9 months in air were investigated. 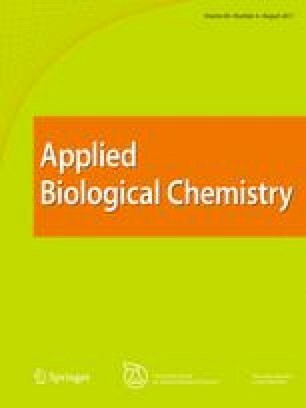 The soluble solid content, titratable acidity (TA), sugars, sorbitol, organic acids, and phenolic compounds were evaluated in this study. We also determined volatile profiles using headspace solid-phase microextraction and gas chromatography–mass spectrometry. Instrumental textural properties and descriptive sensory analysis were also conducted in this study. The correlation coefficients between physicochemical and sensory properties were investigated. In comparison with the untreated apples, those treated with 1-MCP exhibited higher acidity (i.e., higher TA and organic acids), antioxidant total polyphenol content, sum of individual polyphenol content, force linear distance, lower volatile content, b* (yellowness), and fructose and sucrose levels, after long-term cold storage. A significant difference was observed in sensory attributes such as red color of apple peel, textural properties (with peel and without peel), sweet taste, and sour taste between 1-MCP-treated and untreated apples. Sensory attributes related to textural properties (i.e., P_Hardness and Crunchiness) showed positive correlation with instrumental textural properties (force peak and force linear distance) (p < 0.05). A significant positive correlation was observed between red color of apple peels (sensory attribute) and a* (redness) (p < 0.05) and between sour taste and shikimic acid (p < 0.05). The Korea Food Research Institute (Grant No. E0132200-05) provided financial support for this study. This research was supported by the Chung-Ang University Research Grants in 2015.